Due to renovations at the school, the KSMoCA International Art Fair isn’t even hosted at KSMoCA this year! Instead we’re standing inside the Portland Institute for Contemporary Art surrounded by kids from MLK Jr. School and beyond, artists and institutions from our community, and artwork from as far as Copenhagen, and we’re reflecting on how a site-specific project in an elementary school in NE Portland has become a space to contemplate new ways of being in the world. 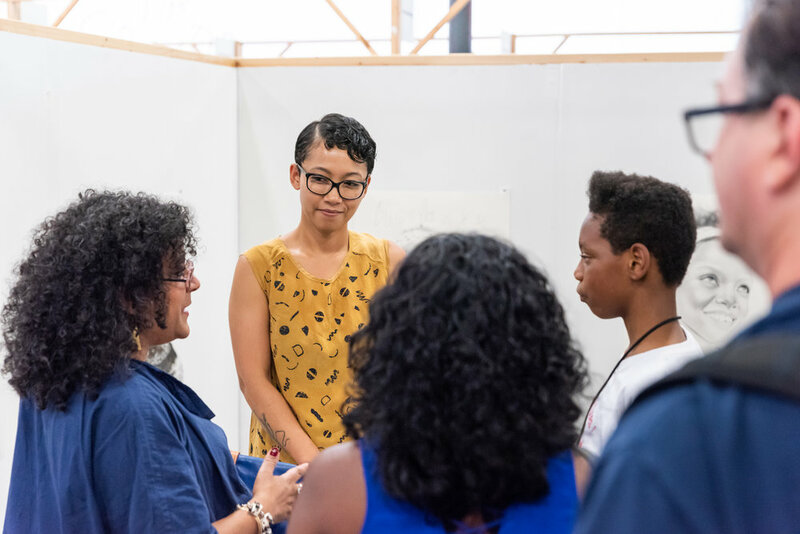 Together with 17 exhibitors, 14 KSMoCA students, 3 Portland State University students, 3 Living School of Art students, several collaborators, and countless volunteers, we’re excitedly thinking out loud—How can we spend more time doing this? Over the last three weeks at PICA, we’ve been meeting as a group to collectively create the type of art fair we want to see. This fair is centered around 1-on-1 relationships between exhibitors and students, and we see these partnerships as essential to the process. Throughout our time together, many things have surfaced as topics, including: joy, dreams, politics, sadness, bell hooks, respect, revelry, cartwheels, self-love, and the market price of a painting. We’ve focused our time thinking about and discussing collaboration and power dynamics between generations, horizontal learning structures, and our own expectations of art. 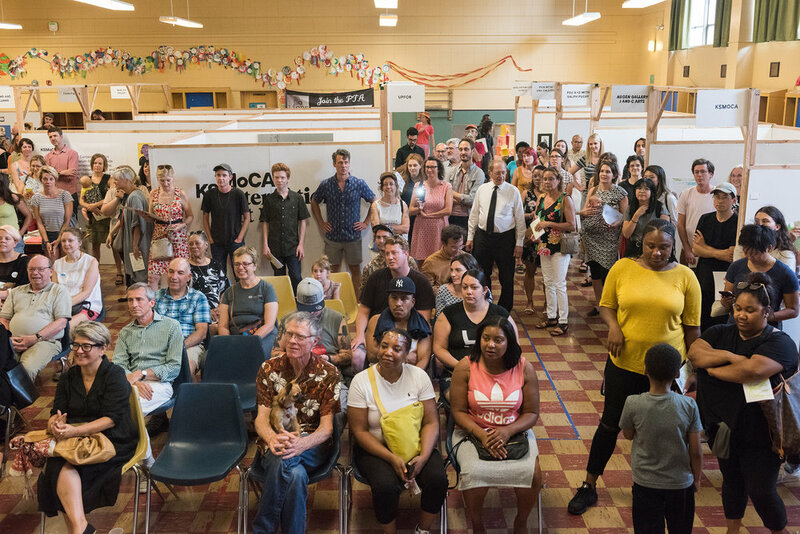 What started as a project for democratizing the “Art Fair Experience” has expanded into an ongoing conversation about community building across institutions and individuals. The fair is an opportunity to see a lot of amazing Portland projects in one space at one time, developing friendships with kids—everyone sharing their resources, curiosity, time, and passion with each other. This experimental art fair makes clear the absolute genius of young people, and it shows us that learning happens in all directions when we let it. Exhibitors will display contemporary artwork that is co-created, curated, organized or produced in collaboration with their student partners. Exhibitions throughout the fair include works by emerging artists, collaborative works with students and presentations by established artists. The KSMoCA International Art Fair is a commercial art fair and many of the works on display will be available for purchase. Blue Sky, Byron Kim, Chicken Coop Contemporary, Douglas F. Cooley Memorial Art Gallery, Elizabeth Leach Gallery in collaboration with c3:initiative, First Brick, KSMoCA, Malia Jensen, Samantha Wall, Nat Turner Project, Nicolai Wallner, Portland Museum of Modern Art, Portland State University Art & Social Practice Program, Portland Tropical Gardens, TINY GALLERY, UNA Gallery, and Victor Maldonado. Yes, that’s a good question. Why would we want to take one of the most commercial aspects of the art world and restructure it for a public school context? And not an empty public school like PS1, but a functioning public school with kids all over the place. Well, we like messing things up, breaking down walls, mixing things together that usually stay separated and in their own contexts. 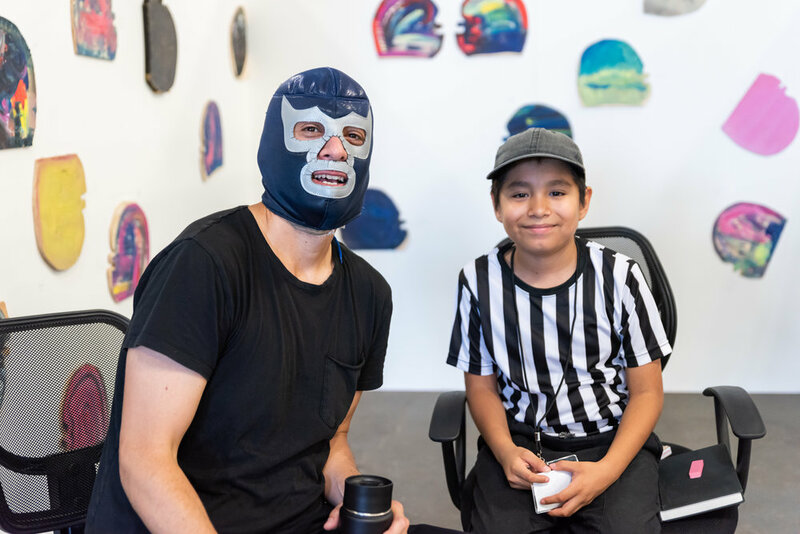 KSMoCA is all about connecting people with art and art systems who might not normally have much exposure to those things. We want the kids at Martin Luther King Jr School to be exposed to the way that art institutions are run so that they have the option to consider becoming not just an artist, but a curator, a preparator, a museum director etc. And well, since the commercial gallery system and art fairs are such a big part of the art world, why not include those things too, so that a MLK Jr School student might decide to become an art dealer if that’s what seemed appealing to them. We are anti-capitalism, but if we are going to live in a capitalist society shouldn’t everyone have the ability to participate in it, messed up as it might be? So for those reasons and more we have readjusted the art fair model to serve a different cause, people can not only come and see a bunch of art all in one place for free, but a set of kids and a school context that would normally be left out of the art world are being included, and maybe some percent of the sales of works at the fair will be donated to the school’s art program, and that’s always a good thing. In fact if you want to just make a straight up donation yourself just let us know and we will tell you how. KSMoCA is pleased to announce the KSMoCA International Art Fair. 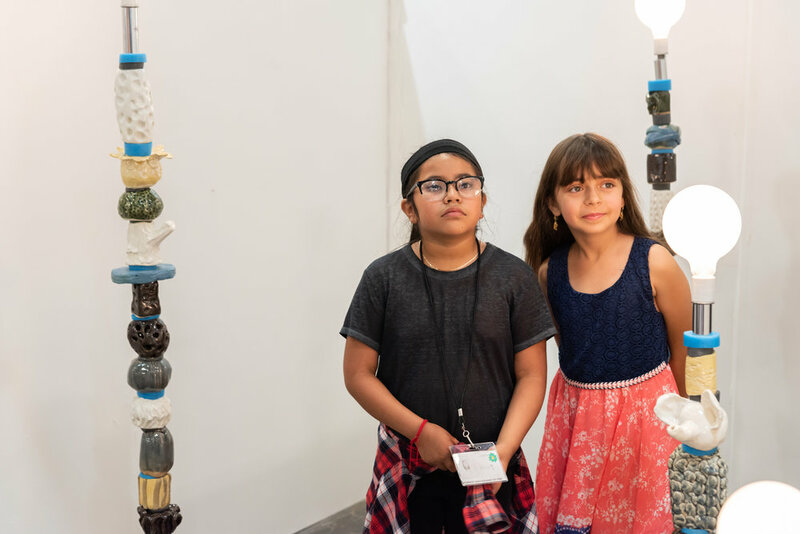 The kid-scale art fair is the culmination of nearly 60 hours of special training that a select group of K-6th grade MLK Jr students and PSU students receive on commercial art fair practices. Seventeen internationally recognized exhibitors will display original artwork available for purchase through a program that uniquely pairs each booth with students who participate as gallerists, artists, and assistants in sales and curatorial projects. Visitors can find works ranging from experimental publications by young artists to museum-quality paintings, sculptures, installations, photography, social practice, comics, and new media. The fair runs from August 11-13, 2017 in partnership with Converge 45 and includes programmed lectures, panels, and performances throughout the weekend. 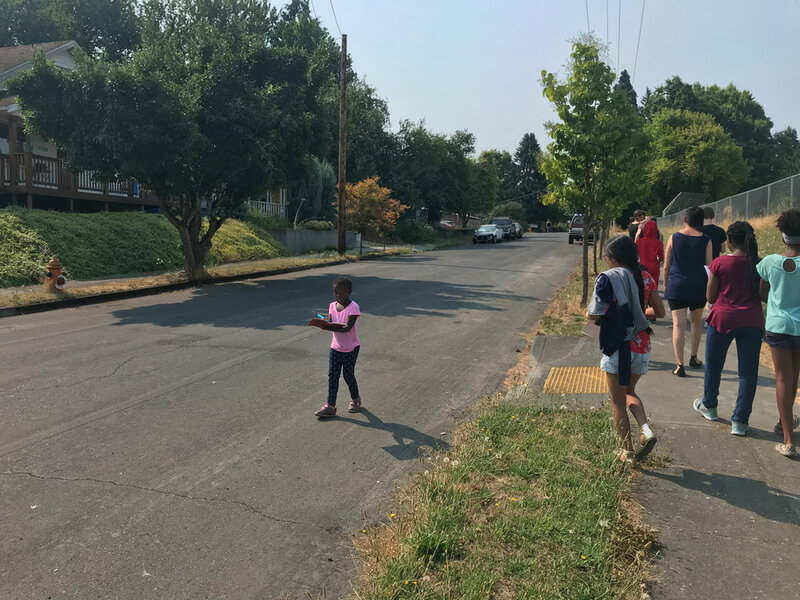 It is organized by Harrell Fletcher and Lisa Jarrett, co-curated by Amanda Leigh Evans and Roz Crews, and is produced in collaboration with MLK Jr School students, PSU students, and community partners. To see the latest updates on the fair, visit this link.